« #MetLifeTakeover Partners With Urban Tailgate! We have officially sold out of tickets! We have nearly 1000 Dolfans coming with us to the Jets game with us this weekend making it the second largest #MetLifeTakeover of all time! Now that we are done selling tickets let’s breakdown the plan for this weekend. Hopefully this will answer everyone’s questions. Read it carefully! We are having a party Saturday night at Slattery’s Midtown Pub from 7-9pm. We do this so people who aren’t from the area can check out our bar and meet people before the game. DJ Tropic will be spinning and Solo D is going to perform and we will be selling merch and doing raffle prizes and all that. It should be fun, come hang out! If you are taking the bus with us to the game (and already bought bus tickets from us, we are sold out!) you will need to meet at Slattery’s at 7am. It takes a while to get everyone signed in and we are boarding the busses at 8am so please come early. Slattery’s will have bagels and coffee for everyone. Please don’t bring coffee or other opened drinks into the bar. Our tailgate starts at 9am and will be held at L4 in the bus lot. If you are driving and meeting us there you should look for a yellow parking pass and then walk over from the car parking area. We offer an all you can eat/drink tailgate option from our friends at Urban Tailgate who are taking care of all of that. 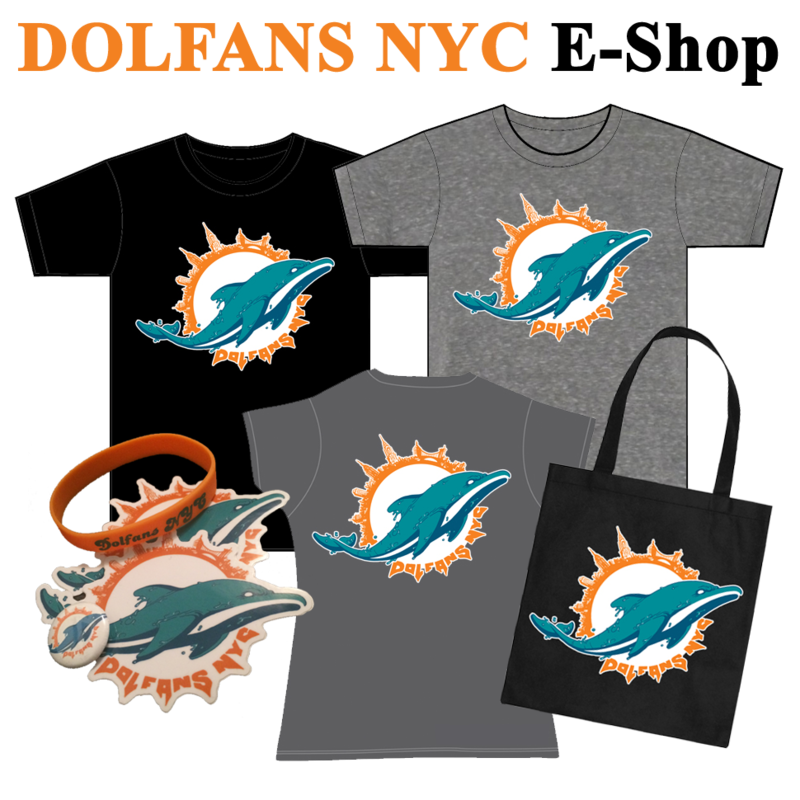 Tailgate tickets are available for $55 using the coupon DolfansNYC but only until 5pm Thursday. After that you can buy a ticket at the game but the price goes up to a staggering $85 so get your ticket no! That being said, you do not need to pay for a tailgate pass to party with us! It’s optional. Feel free to bring your own food and drink and party with us. Bring a grill, bring anything. Let’s blow this thing out! Joe Rose will be taping his Cup of Joe show live from our tailgate! He filmed from Slattery’s last year and it was a big success so they are back. That should be really fun. We also will be having another performance from Solo D and DJ Tropic will be DJing as well. Tons of games will be set up and we will be selling merch and raffling off a Cam Wake signed helmet. Should be a hell of a party. The game starts at 1pm and it’s expected to be sunny and in the 80s! Hell of a change of pace from the last few years. We are completely sold out of tickets but we have sections 345 & 346 plus a lot of seats in 344 so if you can find any of those on the secondary market come get crazy with us. Last week at the Chargers game Dolphins fans made the news for taking over the new LA stadium, so let’s do the same. Let’s get loud as hell but save your voice for big moments. We gotta last all game. Watch for us to lead chants and bring rally towels (we will be selling some too). Let’s get crazy. Oh, make sure you remember a clear bag for your stuff because the they won’t let bags in the stadium. We will be selling those too. After the game if you are on the busses get back quickly because we will be leaving soon after the game. We will be dropping off at Slattery’s and hanging out and watching the late games and hopefully celebrating! Finally, please use the hashtag #MetLifeTakeover as much as possible on any of your social accounts. We wanna get it trending again. Tag the players and the team and let them know what we are doing. Tag us as well. We are @DolfansNYC on everything. Oh, and we are working on a Snaphchat filter for the game so watch for that too! This entry was posted on Wednesday, September 20th, 2017 at 3:03 pm	and is filed under Events. You can follow any responses to this entry through the RSS 2.0 feed. Both comments and pings are currently closed.